Levels with the winter theme are characterized by cold environments with snow and ice. This theme first appeared in Icy Isle in SegaSonic the Hedgehog. Several levels with this theme incorporate use of at least one large, downward slope that the player needs to run, slide, or snowboard down. 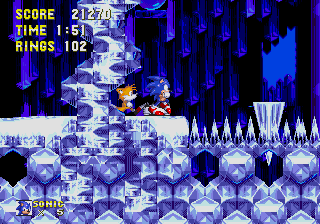 Such a slope is present in IceCap Zone, Ice Mountain Zone in Sonic Advance, Ice Paradise in Sonic Advance 2, Ice Cap in Sonic Adventure, and White Acropolis in Sonic '06. Badniks that utilize the snowy environment include the Pen, Yukimaru, Penguinator, and E-07 Ice Ball. Badniks like these may throw snowballs at the player or serve as freezing traps. Pages in category "Levels with a winter theme"
This page was last edited on 16 December 2017, at 19:30.